Good Time Charters > Captain’s Blog > Uncategorized > How to gender a blue crab? It is so Crabtastic! How to gender a blue crab? It is so Crabtastic! 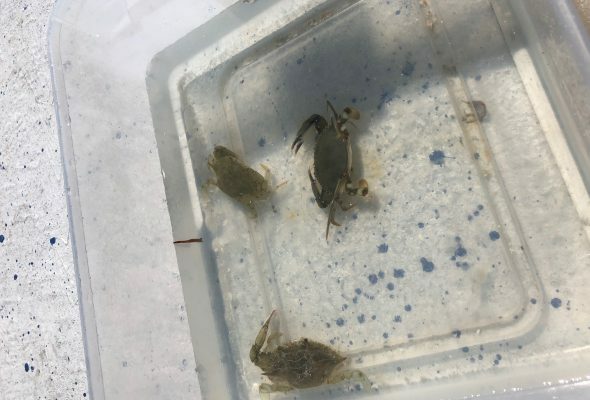 Blue Crab are a common crab found in our estuaries and near shore waters and we find them so crabtivating! They are a commercially important part of our seafood industry here at Fort Myers Beach and while out on our tours you will see many buoys floating on the water that are tied to blue crab pots. 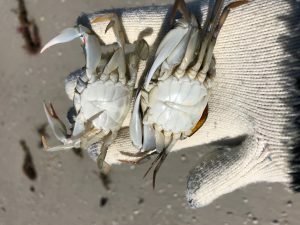 On a recent Coastal Sealife Dolphin and Shelling tour we found some blue crab hanging out near shore while at the shell island so I thought I would write a quick post about how to tell females from males. In the photo, notice the crab on the left has reddish colored claws. The one on the right has blue claws, although the angle makes that difficult to see. The female blue crab has the red claws. Another way to tell is by looking at the “apron” shape. The crab on the left has a pyramid shape apron, the one on the right is an upside down t-shape. An immature female has the pyramid shape, once she matures it will be more like a half moon shape. The males maintains the upside down T-shape. If you are nerdy about science like me you will find this species to be incredibly interesting. The biology of the Blue Crab is definitely crabtivating! Don’t worry, these crab were safely released back into the water.